Subject: CONTACT THE EUROPEAN PAYMENT OFFICE FOR YOUR PRIZE !!! CONTACT THE EUROPEAN PAYMENT OFFICE FOR YOUR PRIZE !!! 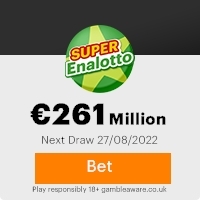 We are delighted to notify you of the result of the free lotto E.U programs held on 4th of May, 2007 your email address was attached to one of the ten winning Ticket numbers (67-84-501) - with Game (Number 7387). It is part of our security protocol to avoid double claiming and to minimize identification difficulties advise you to keep this information confidential until your claim is processed successfully and to avoid unwarranted abuse of this program by some participants. All winnings must be claimed not later than 2 weeks upon receipt of this notification, after this date all unclaimed winnings will be null and void. NOTE: Do not reply this mail. You are to contact your claims officer immediately via the provided email address. In order to avoid unnecessary delays and complications, please remember to quote your reference number in every one of your correspondences. This Email with the Subject "CONTACT THE EUROPEAN PAYMENT OFFICE FOR YOUR PRIZE !!!" was received in one of Scamdex's honeypot email accounts on Sat, 05 May 2007 10:38:03 -0700 and has been classified as a Generic Scam Email. The sender shows as "euresult news" <euresult.news5@gmail.com>, although that address was probably spoofed. We recommend that you do not attempt to contact any persons or organizations referenced in this email, as you may expose yourself to scammers and, at the very least, you will be added to their email address lists for spam purposes.